WASHINGTON/CARACAS–American missionary Josh Holt, held by Venezuela without trial on weapons charges since 2016, returned home with his wife on Saturday after the South American country’s socialist government unexpectedly released them. 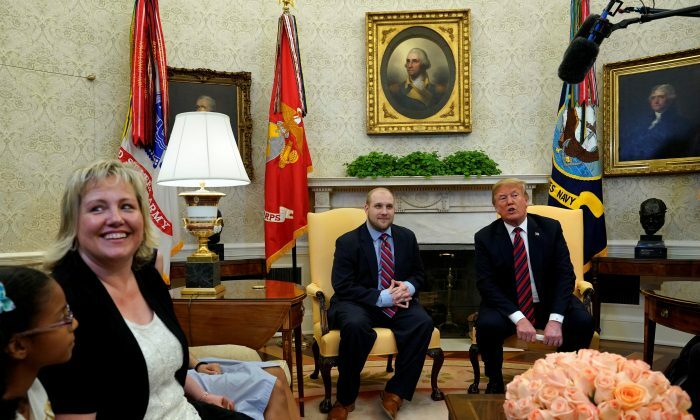 “It’s amazing that you were able to take it … that was a tough situation,” Trump said during a televised meeting at the Oval Office with Holt’s parents. At a news conference in Caracas earlier on Saturday, Venezuelan Communications Minister Jorge Rodriguez said Holt and his wife were freed as part of efforts by Maduro’s government to maintain “respectful diplomatic relations” with Washington. “This type of gesture … allows us to consolidate what has always been our standpoint: dialogue, agreement, respect for our independence, respect for our sovereignty,” Rodriguez said. Holt and his wife had been charged with espionage, violence and spreading activities against Venezuela’s constitutional order, he said. Matt Whitlock, a spokesman for Hatch, said the Utah Republican called Maduro last week after hearing of riots by inmates at the intelligence agency headquarters where Holt was held. In a Facebook post during the uprising, Holt had pleaded for freedom and said people were trying to break into his cell to kill him. In televised comments earlier this month, the No. 2 official in Venezuela’s ruling Socialist Party, Diosdado Cabello, described Holt as “the head of U.S. espionage in Latin America” and said that he would remain behind bars. The United States accuses Maduro’s government of stifling democracy, repressing the opposition and massive corruption. Maduro says Washington is conspiring to topple him and seize the OPEC member’s large oil reserves. He blames a U.S. “economic war” for Venezuela’s fiscal woes, including hyper-inflation and food and medicine shortages that have triggered mass emigration.